A CT scan, also called X-ray computed tomography (X-ray CT) or computerized axial tomography scan (CAT scan), makes use of computer-processed combinations of many X-ray images taken from different angles to produce cross-sectional (tomographic) images (virtual ‘slices’) of specific areas of a scanned object, allowing the user to see inside the object without cutting. When the final day comes at the systems current location, Nationwide crews perform final testing on the system before we remove power from the unit. These tests are to ascertain the condition of the system before it is removed and transported. Some of the items Nationwide checks are the image quality, installed options, disk, generator, console, table and gantry operations. Once these test are performed and documented, the unit is powered down. Power is removed and the cables are disconnected and labeled then neatly packed. All major components are unbolted from the floor and pad wrapped to protect the finish of the components. OEM dollies are attached to the base of the major pieces and removed to be own transported by a modern air ride semi trailer. The units are strapped down within the trailer for a secure ride. Once the unit arrives at the Nationwide facility it is again inventoried. The covers of the pieces are removed from the system and tagged as to their location and system number. The covers are taken to the cosmetic repair center. There they will be prepped, masked and painted to the OEM colors or one of those specified by the customer. The major components are cleaned with a variety of processes that sterilize, cleanse, and prepare these devices for cosmetic’s and operations. There are then moved into a testing bay where they are cabled up and power applied. The system is then again tested to determine if all manufactures mandatory upgrades have been performed, system operational characteristics, software updates, error log review, bearing operations, high tension tank oil contaminants, HT cable wear, noises, fan operation, slip ring condition, brush block condition, HV output, tube alignment, tube slice count, styles of disk drives, tape systems, phantoms, etc. Any item that does not exceed the manufacturers specifications or are close to failing are replaced. Once the system has been thoroughly and completely tested and checked, the covers are reattached and the system is energized for 24 hours to monitor for system faults under test and heated operations. Once this is competed the system is then certified reconditioned. The unit is de-cabled and wrapped for its’ move to a new home. There it will be professionally installed by one of Nationwide’s crews. Once installed a professional CT trainer will provide applications on the methods available and proper operation of the CT scanner. At Nationwide Imaging we make sure to work with the top brands to ensure our medical imaging equipment only provides exceptional performance with a long lasting lifespan. 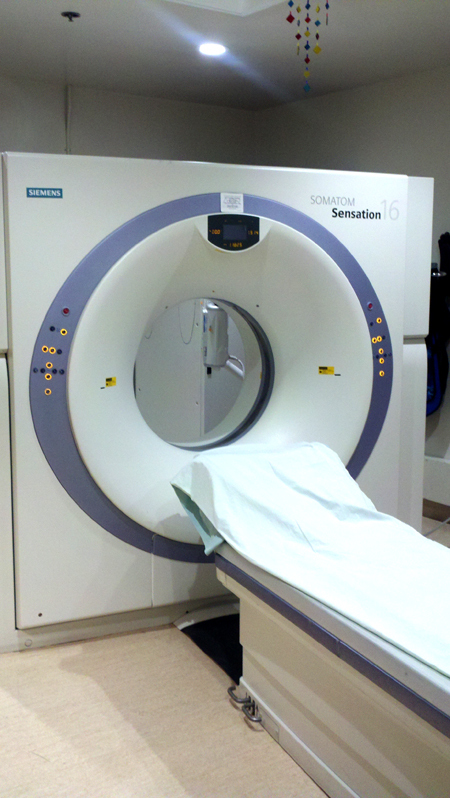 Some of the top reconditioned CT Scanner manufacturers include Toshiba, Siemens, Philips, and GE.